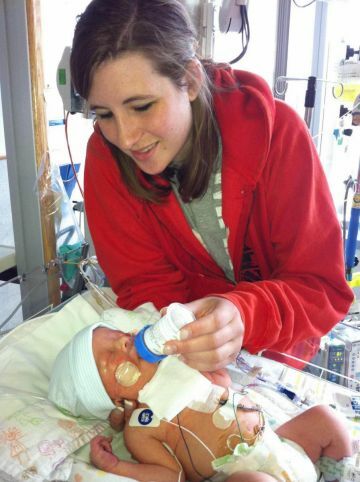 This baby's tumor was removed before he was even born—and the story is absolutely incredible. When Katie Rice went in for her 20-week ultrasound appointment, she was mostly looking forward to learning her baby's gender. But the mother received some heartbreaking news: After performing a series of scans, Rice's doctor told her and her partner, Mike Roussin, that they had located a mass on the baby's heart. The mass turned out to be a very rare lethal tumor called an intrapericardial teratoma. While this story is devastating, we're happy to report that it took an amazing turn. CBS News shared the details. Rice and Roussin decided to pursue a risky surgical procedure at Children's Hospital of Philadelphia—the surgery had never been performed successfully before. A team of cardiologists, surgeons and obstetricians managed to do something miraculous, though: They removed the mass while the baby boy was still in Rice's womb. According to doctors involved, the baby would not have survived if they hadn't intervened quickly. Rice was 24 weeks pregnant when they performed the procedure, and doctors could tell the tumor was growing rapidly. The procedure seemingly succeeded against all odds. "We just happened to have had some cases of the same diagnosis in the months leading up to it and they were very frustrating and really sad outcomes," Holly Hendrick, M.D., an attending pediatric and fetal surgeon at CHOP, told CBS News. "And so when Tucker’s mom presented, we had just come off the heels of these other cases and the idea of ‘how can we make things better?’ She had really come sort of on the heels of that and those discussions. It was really dramatic—the tumor growth—and when we looked at some of prior cases and she was still OK, we knew that another week and we would have lost the war."